Last Wednesday I made use of my summer membership to Studio 2 3 and completed a 2-color screenprint! I really enjoyed using the studio, hanging out with other printmakers and seeing them create their artwork while I created mine. I am now inspired to make more screenprint editions. I enjoy the process because I can paint with ink directly onto a sheet of mylar or acetate and then create the screen using the drawing. I might post a little step-by-step to show you what I mean for further editions. Here is the completed screenprint! I used gold and brown ink. I actually editioned two versions. The first version is on the left, and it shows my original intended image. 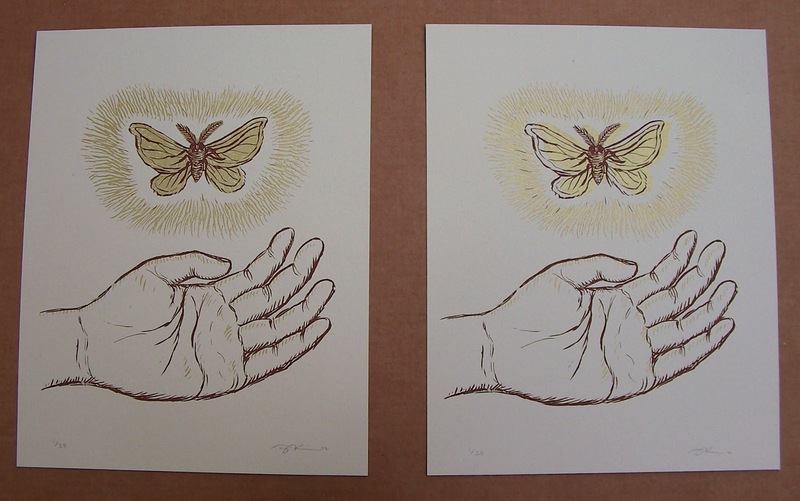 Version #2 on the right shows a slightly off-register image - I printed the brown slightly to the left of the gold moth. You can see it a little better in the detail photo. 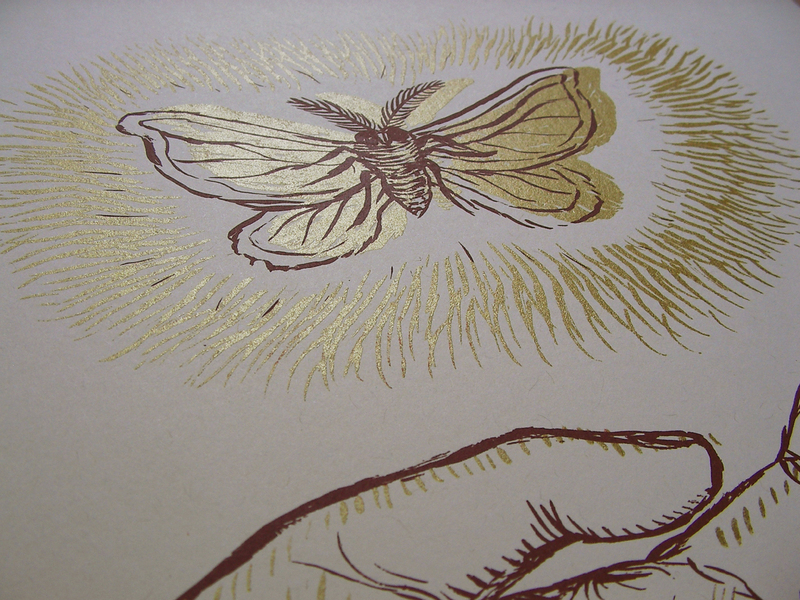 I made an edition of 29 for Version #1, and then halfway through I decided I liked how it appeared off-register because it made the moth look more like it was fluttering in motion. Version #2 has 20 copies. This past Saturday was The Golden Moth Release Party at the Blue Elephant. It went well! I was very nervous before the party, even though most people who came were friends who I had no reason to be nervous over. But it was the first time I publicly released the deck for other people to take home with them, so there is always some anxiety before presenting my artwork to an audience. I will post photos and write about the event in more detail very soon. Today I went to the post office and sent off 24 packages! More will keep rolling through the postal system throughout this week and next. Whew! I can't believe that it's really going out into the world! I feel relieved, as if I am finally coming to the end of the road. But I know that putting this deck out into the world is just the beginning. It is a way of reaching out to others, and I don't know what other surprises await me. While the process has been difficult in some ways, it has taught me a LOT. I plan to write more about what I learned from it all, and also share some advice for people who want to start their own Kickstarter campaigns. That's all for now. More soon, I promise. I just want to update people after that negative post I left the other day. I am feeling better. 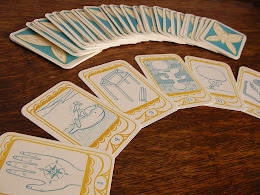 I am scheduled to receive my new corner-rounder today, so Moth Deck production should be in full swing again soon. On Tuesday I had another freak-out and felt like crap again. I bicycled in the rain to a health-food store and bought some herbal and homeopathic supplements to help with anxiety, and I started to take my B-complex vitamin again. I am a vegetarian, and lately I wonder if I'm not getting the right kind of nutrition that my body needs. I think that my physical state is affecting my mental state, and vice versa. This project has been stressful, but so is most anything to me. I have been an anxious person all my life, and I need to find healthy ways to release anxiety. Usually, making art helps me to do that, but this time it actually contributes to my stress. As I get older, I notice that my metabolism is also slowing down more too. I need to work harder to maintain my health. I am trying to attend more yoga and exercise classes at the YMCA, and it does help. I also have to pay attention to my diet and make sure I'm getting enough protein, B-vitamins, and amino acids. I am even considering eating a little bit of meat until I can figure out how to best maintain my health on a vegetarian diet. On the bright side, yesterday I ate as much good stuff as I could stuff in my system - bee pollen, a protein-shake, salad, eggs, and anti-stress supplements. I did feel better, and I went into the studio and finished the 2-color screenprint which is the last reward I needed to finish for the Golden Moth project! I bought a summer membership to Studio 2 3, and I really enjoy using the studio. It's nice to be around other printmakers to get artistic input, advice, and inspiration. I will post pics of the screenprint very soon. Now I have a lot to do to get ready for the Release Party at Blue Elephant this Saturday. Time to get off the computer and start working! It started last night. The feelings of anxiety and of being totally overwhelmed by the Golden Moth project. It gave me weird dreams last night. And then I woke up to find that I had problems with the corner-rounder. The blade seems to be getting dull and it doesn't cut the way it used to. Then it all spiralled out of control as I become engulfed in negativity and hysteria. My eyelids are all pink and raw from the tears. I haven't shared much about how hard this process has been for me. I know I should just feel lucky and excited to be working on this project and the fact that it was funded through Kickstarter, but it has been DIFFICULT the whole way through. Like a birthing process, the baby just ain't popping out without a hitch. There have been setbacks and things that I should've done better, ways I should've worked faster or harder. There have been many hours where I whiled away the hours aimlessly on the internet, procrastinating and filled with anxiety because I couldn't face this project head-on. Times sitting at my drawing table with pen in hand and feeling like art is the hardest thing in the world to do. There have been screams. And there have been tears. For some reason I just snapped this morning. I've been working on assembling the card decks for about two weeks straight. I've had lots of people come over to help, which has been a blessing and helped keep me in a good mood. But the assembly is simply tedious. When will it end? When will I ever finish? There have been little setbacks in almost every step of this process. Things I just couldn't have forseen. Things that take time to fix or figure out. I am tired from the hundreds of hours of working on this project. I feel like it is all carving a place inside me, digging a depth of emotion and labor and questioning. The bigger question is: "Why do I make art at all? What has it brought me?" I guess you could say I'm treading into the zone of despair. I just turned 30 a few days ago. Three decades of life gone by, and here I am poor as ever and making things that 99.9999% of the population doesn't care about. For some reason, I care. I wish I was born with a head for math or computers or science. Subjects considered useful in our world and especially in our country, because the American government doesn't give a goddamn about arts or culture. Why am I toiling away at this? Why can't I just get a normal job and live a cushy life and eat out whenever I want to? Own a car and a house and go on vacations? And just do art as a hobby? Why do I feel that what I do is important in some way and actually contributes or uplifts anyone in this world? To answer that last question - some people have told me it does. More than a handful. And to me it's the most fulfilling thing I can do with my time and my life. Because I do love it. I wanted to be an artist ever since I was old enough to draw. Also, I'm just not good at anything else. I'm hopelessly illogical and stubborn, even idiotic at times. It took me until my twenties to feel comfortable pumping gas and shopping for clothes. I have been so incredibly awkward and dreamy my entire life that I have had to work on life skills that most people were capable of in their teens. It doesn't help that I also look ten years younger than my actual age. Most people guess I am in my early twenties. Yes, I do look young physically. But the worst part is that I also act like I'm in my early twenties - wandering around with not a clue as to how I am going to make it in this world. Sometimes I just feel like giving up. I'm not sure exactly what I'd do if I did. Right now I feel like Atreyu in The Never-Ending Story, a movie I used to love watching as a kid. I feel like I'm in the part where Atreyu is in the Swamp of Sadness. He's slogging through the mud and it's getting deeper and deeper and Artax, his beloved horse, doesn't want to go on anymore and gets swallowed up in the swamp. Atreyu keeps on going but he's getting overwhelmed by despair and mud until he thinks he can't make it anymore. And that's when Falcor the Luck Dragon swoops down and saves him. I know I have a my boyfriend, family, friends, and even strangers who are there for me. But sometimes you just want a big, happy luck dragon to come down and take you up into the sky. You want to surrender and hold on and know that no matter what happens, things will be more than alright. That some have noticed and benefited from all the searching and wandering that you did. That you put something beautiful in the world that wasn't there before. That it was worth it.